We’re getting reports of the death of Elena Obraztsova. The great mezzo-soprano was 76. She was having medical treatment in Germany. 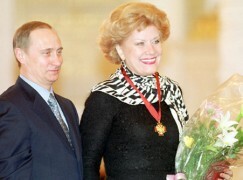 Born in Leningrad during the siege, Elena came to attention in a 1963 Boris Godunov at the Bolshoi. She performed and recorded extensively abroad with Karajan and Abbado, for whom she opened the 1977 La Scala season in Don Carlos. In 1978, she filmed Carmen opposite Plácido Domingo in a Franco Zeffirelli TV production. In 2007 Obraztsova she became artistic director of opera at the Mikhaylovsky Theatre in St. Petersburg, resigning after a year though maintaining her links with the theatre. She was a truly great and inspiring artist and woman… She was super stylish had a fabulous sense of humour. I learnt so much from her. She will be very missed and never forgotten! First, she was only 75, not “76”. Second, her live recording of Carmen is notable not only for being “opposite Plácido Domingo in a Franco Zeffirelli TV production” but also (and for some of us, primarily) because it was conducted by some guy named Carlos Kleiber who apparently has not made very many operatic video recordings. Actually the Carmen is the least of what she accomplished. yes indeed it was conducted by the great Maestro and let’s be honest: not anyone since the great singer and stunning looking Elena had the neiter the depth (listen to Dalila) nor the special colour of this great and unforgettable Mezzo. She was a real powerhouse! I wished one nowadays would come close….none! As Eboli conducted by great Abbado she brought la Scala down where an Italian Mezzo like Bartoli is booed (certainly not for singing Eboli….). She was a favourite of Karajan and has done a few recordings with Claudio Abbado. Elena, will miss you badly but fortunately we have many great recordings with you, especially those which are live! I want to remind everyone to listen to her Marina next to Vladimir Atlantov, fantastic also! Her mezzo was never among the world’s greatest vocal instruments by nature, and she may not have been at her best in that production – there are unquestionably better-sung Carmens on record – but her performance was certainly respectable in it, and, in any case, collaborating with Maestro CK in a major leading role has to be considered as one of the most significant accomplishment in any opera singer’s career. Also, by the way, she was not “born in Leningrad during the siege”. According to all reliable sources, she was born in July 1939 – definitely not later than that – which was more than two years before the siege of Leningrad actually started in early September of 1941. The Zeffirelli/Kleiber Carmen was a new Vienna State Opera production that was televised. Do we call that a “TV production”? No. That is the wrong term. This is simply the televising of a normal performance in the theater, a precursor of Met Live in HD. NBC-TV used to make TV movies of operas, and then of course there are bona fide opera movies such as those by Jean-Pierre Ponnelle. But the verb “filmed” is OK because we don’t have anything better in our language, even if film is not used. The Russian obituary says she was born in 1939. The siege of Leiningrad began on September 8, 1941. She may well have lived through the siege, and thus had a miserable infancy, but it would be nice if this site made some attempt at journalistic accuracy.